In American Gulag Archipelago and American Apartheid, Panderbear described an unparalleled explosion in American incarceration rates due to the 'War on Drugs' and draconian sentencing guidelines. In the 1980's and 1990's a candidate declaring his opponent 'soft on crime' was the pander of choice. It supplanted the previous generation's 'soft on communism' pander. Criminalization of marijuana flooded our prisons with people whose only crime was possession of a substance less harmful than alcohol, America's accepted drug of choice. Millions of Americans 'experimented' with marijuana. Only the unwary or unlucky wound up in prison, often with sentences far longer than for more serious and violent crimes. Aside from the harm to the nation resulting from an unprecedented increase in human degradation and wasted human potential, locking up over 2 million Americans is monumentally expensive. For the past 20 years states have increased spending on prisons 6 times faster than spending on higher education. As Fareed Zakaria recently wrote in 'Incarceration Nation', "In 2011, California spent $9.6 billion on prisons vs. $5.7 billion on the UC system and state colleges. Since 1980, California has built one college campus and 21 prisons. A college student costs the state $8,667 per year; a prisoner costs it $45,006 a year." Panderbear suggests with only a small wink that it would be more cost effective to send pot possessors to college than to prison. 'Smoke pot? Go to college.' Sounds like the 60's all over again to Panderbear. The roots of the laws making the U.S. the world's number one jailor lie in Americans' vindictive free will-based, punishment-for-its-own sake attitudes toward crime and punishment. We have a system that is all stick and no carrot, all retribution uninformed by enlightened self-interest or human compassion. Our sentencing guidelines lack perspective regarding what is a truly heinous crime and what should arguably not be a crime at all. 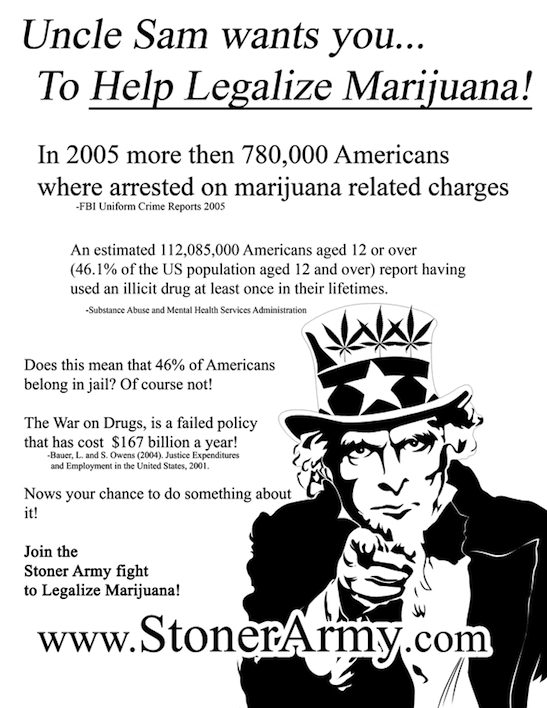 Even televangelist Pat Robertson recently said that America's War on Drugs has failed and marijuana should be legalized. Panderbear favors legalizing pot and emptying our prisons of those convicted only of possession. Let's spend our limited resources building colleges, not prisons. Educate, not incarcerate. I think marijuana should not be legalized because people aren't that responsible. I work in a NY rehab center and I saw how many teens' lives are almost wasted because of drug addiction.